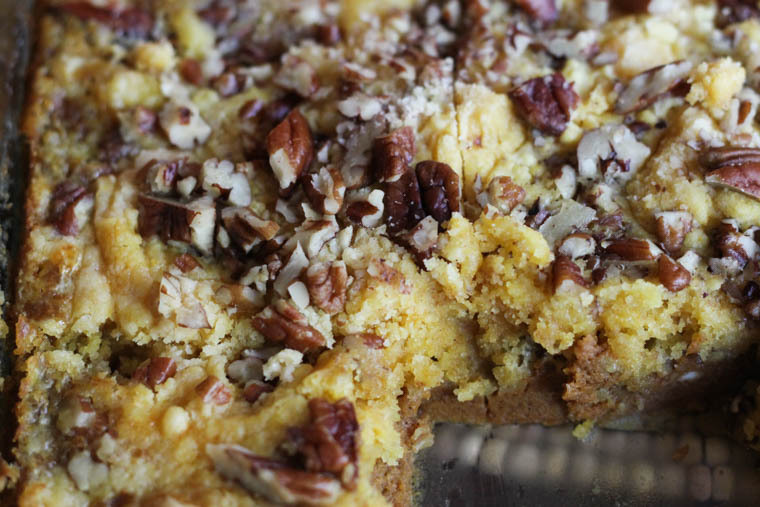 I honestly cannot remember how I stumbled on this pumpkin dump cake recipe over 5 years ago. What I do know is that I make it multiple times each fall and winter. 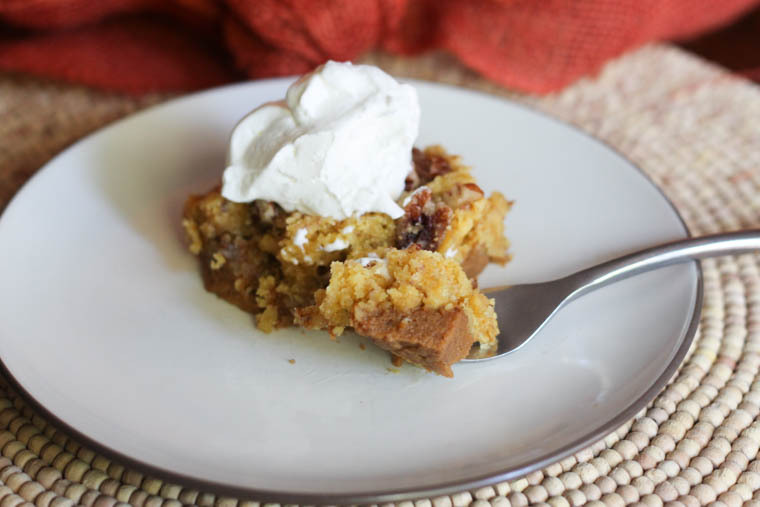 It is by far one of my husband’s favorite desserts I make and it serves as a great alternative to pumpkin pie if you’re not a fan (like me). I don’t despise pumpkin pie. I just would rather have about 15 other desserts before I would pick it. 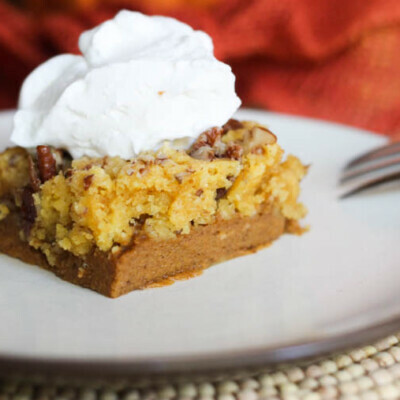 While this pumpkin dump cake does have pumpkin pie as a base, it is also is partnered with a crumbly, buttery crust that is invaded with toasted pecans. 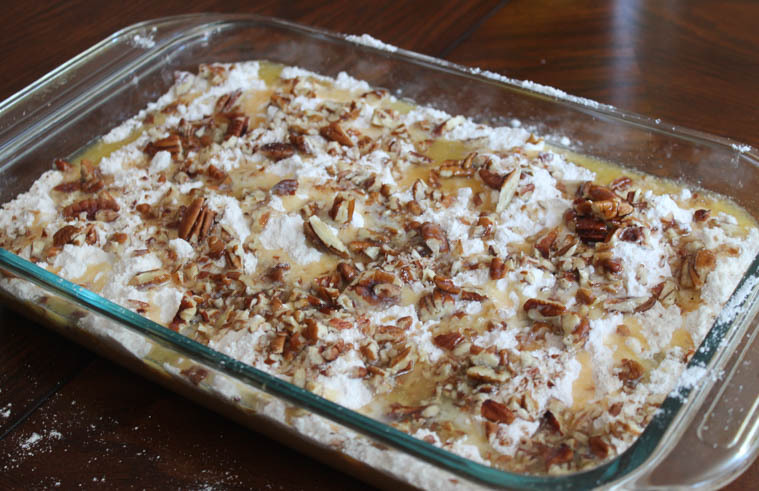 The saltiness from the pecans balance out the sweetness to make a perfect combination. Top it with a little homemade whipped cream and you’ll feel like you’re eating a baby angel. 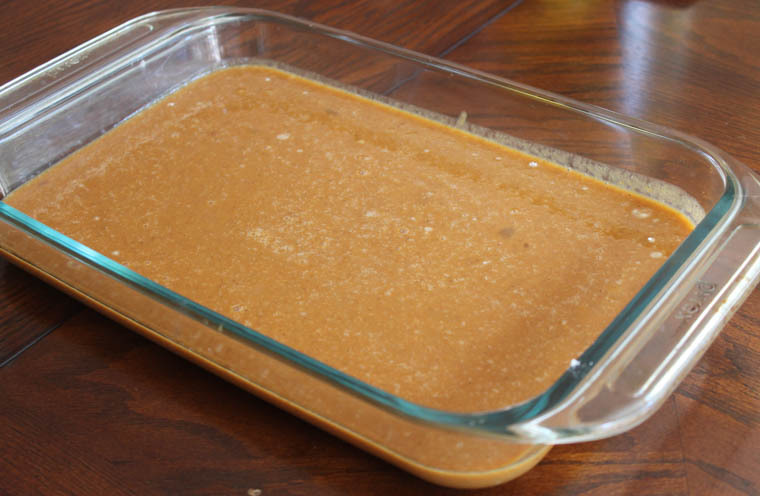 Start by combining your pumpkin, evaporated milk, sugar, seasonings. Add in one egg at a time. 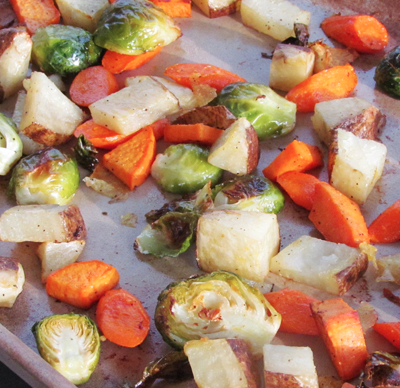 Once all these ingredients are mixed, pour them into a prepared 9×13 baking dish. Sprinkle the entire contents of one box of yellow cake mix over the pumpkin mixture. If you want want to make your own cake mix, here is a recipe you can use. Sprinkle chopped pecans all over your mix and then drizzle it with melted butter. Bake 40 minutes with a piece of foil loosely wrapped over it (to prevent pecans from burning). Remove the foil and bake 15 more minutes. Give it lots of time to cool down before serving. We’re talking like hours. If you don’t have that time, it’ll be fine. I just prefer mine to be cooled down a bit. It helps the pumpkin solidify too. 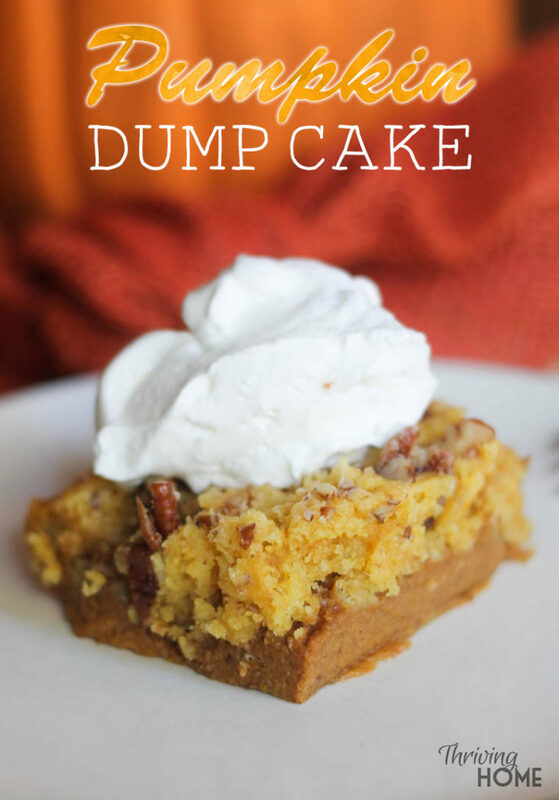 Now here is the key difference in an OK pumpkin dump cake and an amazing pumpkin dump cake: whipped cream. 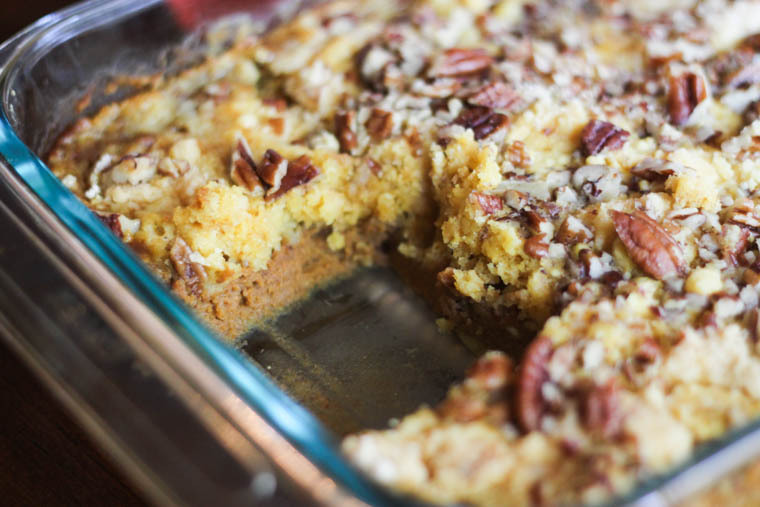 Another great thing about this pumpkin dump cake recipe is that it makes great leftovers. It will still be good a few days after it was made. Just store in the fridge in an airtight container. Either warm it up or just eat it cold. I like it both ways. You’ve got to have it. This easy to make, crowd-pleaser recipe goes a long away (serves 9-12 people). 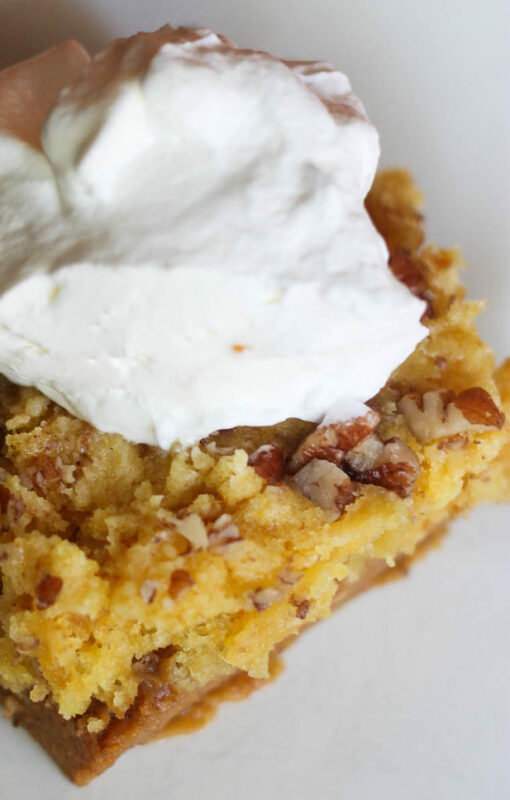 It is a delicious twist on classic pumpkin pie that almost any age will like. Let cool for a few hours. Serve with whipped cream. Oh, my! 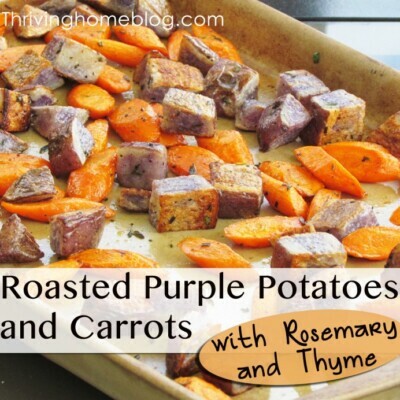 Thanks for sharing this recipe again. I just tried it and served it at our church community group here at my house on this cool, November night, and it was a hit! 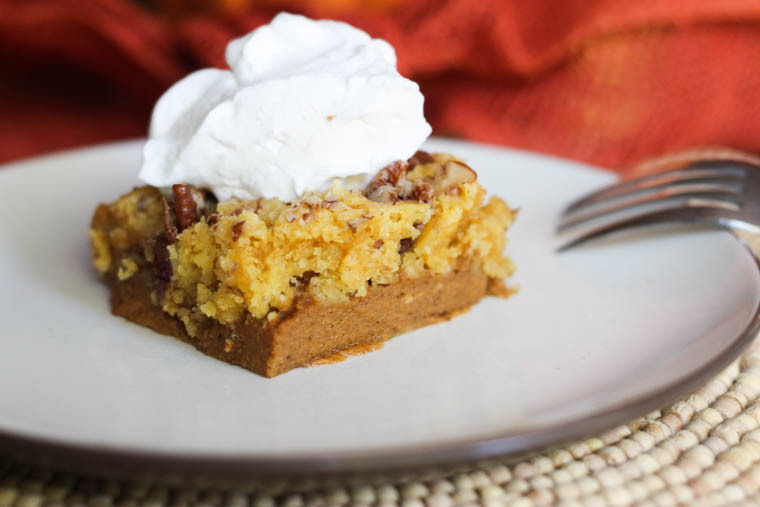 I’m sure it will be a favorite for us, not only because it’s really tasty and pumpkiny, but it’s so easy, too! That’s awesome! I serve it to our small group Bible study every year around this time. Glad it worked for you too! I am going to try this with my homemade cake mix recipe and am excited! Question: Is your can of pumpkin a 29 oz or a 15 oz can? Thanks. I made this dessert for my ladies Poker Group last night. It was a great success! Thanks for the recipe. To Laura, above…I used the 15 oz. can.